Jacob Bongers was born and raised in San Jose, California. He received his B.A. in Interdisciplinary Archaeology at the University of Southern California. 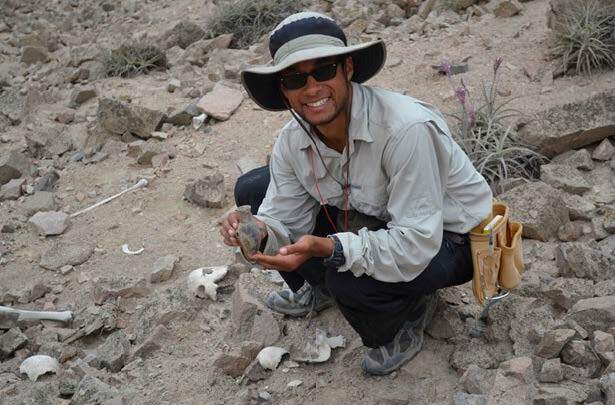 Prior to joining the Cotsen Institute of Archaeology at the University of California, Los Angeles, Jacob conducted fieldwork in Portugal, Chile, Peru, Ethiopia, and Oman. He is currently researching the development of late prehistoric mortuary practices in the middle Chincha Valley, Peru. At the University of California, Los Angeles, he works with Dr. Charles Stanish (Professor, Department of Anthropology). Broadly, I am interested in the development of mortuary practice in contexts experiencing profound social and political transformations. For my dissertation, I aim to 1) explore the nature, chronology, and variability of local mortuary practices in the middle Chincha Valley, Peru and 2) offer explanations for why local groups adopted different mortuary traditions during the Late Intermediate Period, or LIP (AD 1000-1476) and the Late Horizon (AD 1476 – 1532). I employ GIS, R (programming language), geospatial mapping, photogrammetry, radiometric and archaeological methods for data collection and analysis. Weinberg, C., Nigra, B. T., Lozada, M. C., Stanish, C. S., Tantalean, H., Bongers, J., & Jones, T. (2016). Demographic Analysis of a Looted late Intermediate Period Tomb, Chincha Valley, Peru. Andean Past, 12(1), 133–154. Arnold, J. E., Sunell, S., Nigra, B. T., Bishop, K. J., Jones, T., & Bongers, J. (2015). Entrenched Disbelief: Complex Hunter-Gatherers and the Case for Inclusive Cultural Evolutionary Thinking. Journal of Archaeological Method and Theory, 23(2), 1-52. Harrower, M.J., O’Meara, K.O., Basile, J.J., Swerida, J.L., Dumitru, I.A., Hickman, C.J., Bongers, J.L., Bailey, C.J., Fieldhouse, E. (2014). If a Picture is Worth a Thousand Words…3D Modeling a Bronze Age Tower in Oman. World Archaeology, 46(1), 43-62. Nigra, B.T., Jones, T., Bongers, J., Stanish, C., Tantaleán, H., Pérez, K. (2014). The Chincha Kingdom: The Archaeology of the Late Intermediate Period South Coast, Peru. Backdirt. Bongers, J., Arkush, E., & Harrower, M. (2012). Landscapes of Death: GIS-Based Analyses of Chullpas in the Western Lake Titicaca Basin. Journal of Archaeological Science, 39(6), 1687-1693. 2016 Bongers, J., Jackson, B., Jones, T. Mortuary Practice in the Mid-Chincha Valley, Peru: New Discoveries and Emerging Models. UCLA, Los Angeles, CA, April 27th. 2016 Bongers, J. Dead Body Politics: Inca Conquest and Mortuary Practice in the mid-Chincha Valley, Peru. University of Southern California, Los Angeles, CA, March 3rd. 2015 Bongers, J. The Treatment of the Dead in Ancient Peru. Natural History Museum, Los Angeles, CA, September 1st. 2015 Bongers, J. Death, Mummies, and Society: An Examination of Ancient Peruvian Mortuary Practices. Natural History Museum, Los Angeles, CA, August 26th, 27th, and 29th. 2015 Bongers, J. Funerary Practices of the Chincha Kingdom in the Mid Chincha, Valley, Peru. Pierce College, Los Angeles, CA, March 5th. 2014 Bongers, J. Mortuary Monuments and Ancestral Veneration: Recent Archaeological Discoveries in the Chincha Valley, Peru. University of Southern California, Los Angeles, CA, April 22nd.